Working with our neighbours - Crossrail . For information about the Elizabeth line please visit the Transport for London website. Crossrail is working with Swanlea School, in Whitechapel, to maximise learning opportunities from having Europe’s largest infrastructure project on its doorstep. 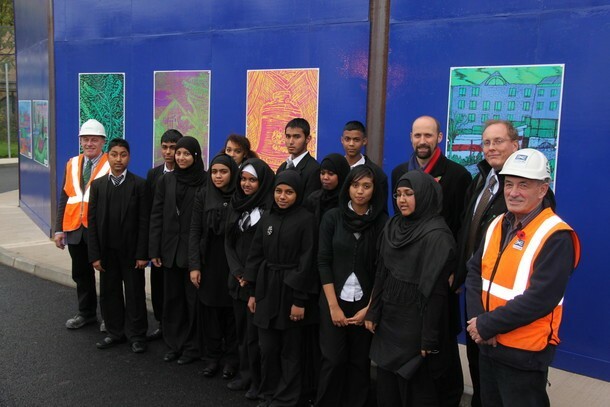 The project has also run an art competition for pupils to decorate the worksite hoardings around the school grounds. Employees from the project are helping Swanlea School teachers deliver Crossrail as a study subject for a sixth form business studies course. During the 20 week long course, Crossrail staff will act as guest lecturers on topics such as planning, costing, programming and organisation. Course work will be brought to life with real examples from both Whitechapel station works and from across the entire Crossrail project. Prior to the summer holidays a painting competition was launched for pupils to improve the appearance of the site boundary facing the school. Over 40 year eleven pupils submitted entries under the theme ‘garden’ or ‘reasons to visit Whitechapel’. Sixteen winning designs have been chosen to brighten up the construction hoardings around the school’s garden.